Those of us in the field of data entry or who are regularly required to type a significant amount of text always need to be able to correctly use a keyboard. TypeFaster is a piece of software which enables you to learn how to 'touch type'. In other words you will no longer have to look at the keys in order to correctly enter text. This package is absolutely free to use and requires very little memory space. A simple and clear-cut user interface cuts down on the learning curve. Users can quick gauge their process to appreciate how far they have advanced. May not be as entertaining as more modern third-party software versions. Other languages such as Russian Japanese and Chinese are not yet supported by this package. TypeFaster currently supports 14 different keyboard languages. Both American and British English are likewise included within this list. Both single- and multi-user options are possible to enjoy a great benefit when learning how to touch type with others. The software clearly indicates which fingers to use and the source code is available if you wish to embed it within a webpage. TypeFaster is your go-to-source if you are looking for an effective and flexible typing program. Other features include a three-dimensional typing game lessons designed for coaches and teachers ongoing feedback and different accounts when more than one user is present. It is only 1.81 megabytes in size so older systems will not be impeded. 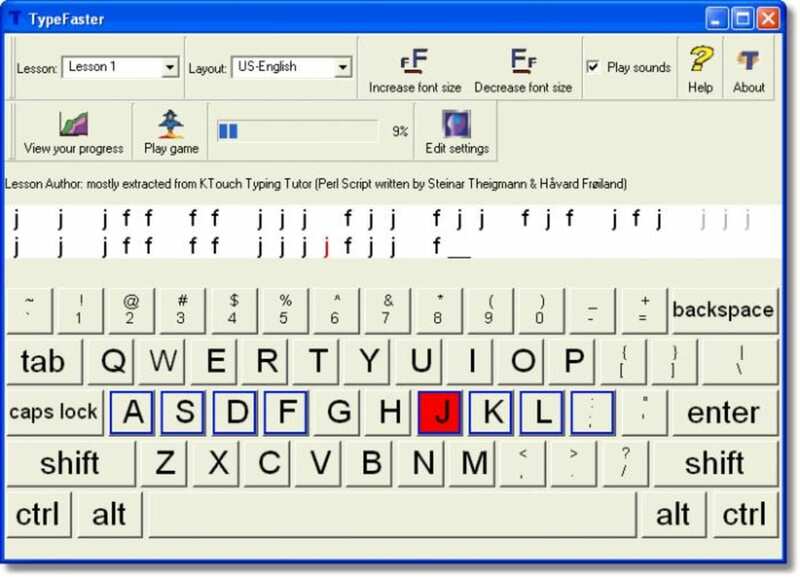 This free typing tutor teaches you how to touch-type. Once you can touch-type you will not need to look at the keyboard to find the letters you want to type. Mostly really good. I like this program a lot. I found it very useful as someone who can already type fairly quickly, but wanted to train myself to actually touch-type, so I don't have to think about what I'm actually doing. Tracking of your progress, customisable dictionaries, and being able to test your slowest and least accurate words is great. Thank You!. I have used computers all my life but never learned how to type with proper form. Not to say I was slow before, but I am substantially faster now and can type without looking at the keyboard! I would not recommend this program for beginners though (ie: children) because the vocabulary necessary is semi-advanced ie:propagandist, sadist, disenchantment, etc. What do you think about TypeFaster? Do you recommend it? Why?